We want to create a Christmas square where children and adults can have fun, where they can enter the spirit of Christmas and maybe even believe in miracles again. Would you like to be one of Santa Claus' elves for a while and help out? Then, join us! What's the main thing a Christmas square has to have? Why, a Christmas tree,of course! In my opinion, the dizzying aroma of spruce needles, Christmas tree decorations and strands of light have been part of every Christmas holiday since my childhood - so they're a must for my vision of a Christmas square. 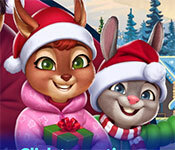 This game has a free trial verison, click to start Shopping Clutter 2: Christmas Square Free Download, if you like this game, please buy the full version to support the developer, thanks. Sign-up to get informed when the Shopping Clutter series has new game released with BD Studio Games' FREE bi-weekly newsletter.